Over Thanksgiving break, I made a boo boo. My sister-in-law’s mom absolutely LOVES the s’mores candy bars that I make, and I had promised to make her a couple when we all got together for Thanksgiving. Well, 58 things down on my to-do list later, and I completely forgot about making these for her…and didn’t realize it until she was looking at the pumpkin cookies I brought that were sitting on the counter, then poked out that lower lip and asked where the candy bars were. Yikes. I felt horrible, and promised her that I would make them the following week for her and bring them over when we all got together for dinner again. Fast forward a few days, and guess what? The day of our dinner gathering, I went into the kitchen to make the candy bars for her…only to realize that I was missing two out of three ingredients to make them. Dag nabbit. 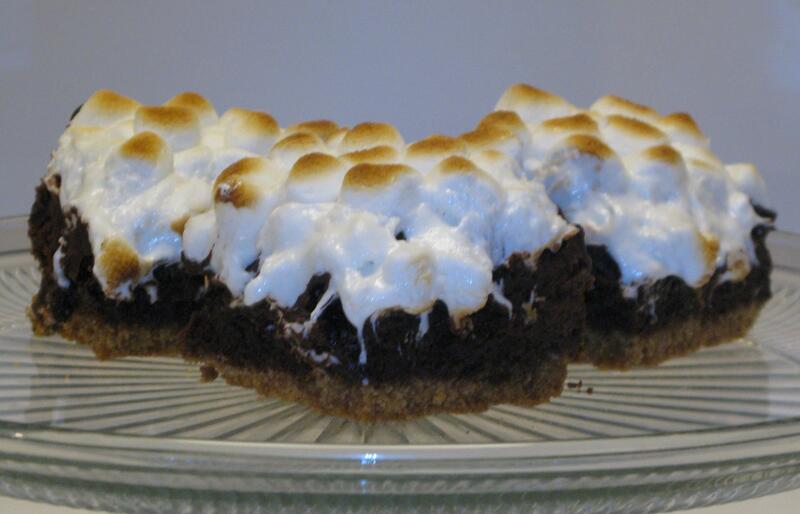 So, I had to improvise, and started researching other s’mores recipes. Preheat oven to 325 degrees F. Line 8×8-inch pan with foil so it hangs over the edges a bit. Spray with nonstick spray. (You can use 9×9-inch pan, but baking time might need slight decrease and your end result will be a slightly thinner brownie). In a medium bowl, mix butter with crumbs and sugar. Press crumb mixture into the bottom of the pan. Bake until golden, 15 to 20 minutes. Place butter and chocolate in microwave-safe bowl. Melt for 30 seconds; stir. Melt another 30 seconds; stir. Keep microwaving at 30 second intervals until mixture is completely melted. Add sugars, vanilla and salt into the melted chocolate and mix together. Add eggs and beat vigorously until you see a thick and glossy batter. Stir in flour and mix just until incorporated. Pour batter over the baked crust. Bake until top is set and toothpick inserted into the middle comes out mostly clean, 35 to 40 minutes (you don’t want to overbake the brownie- a little gooey inside is good). Remove pan from oven. Turn up heat on the oven to broil. Sprinkle chocolate chunks over the baked brownie. Add a nice, thick layer of marshmallows next. Sprinkle graham cracker crumbs on top. Place your pan of brownies back into the oven (they should be 6 to 8 inches away from the heating element). Toast under the broiler until golden- KEEP AN EYE ON IT- it can go from golden to burned in a matter of seconds. 1 to 2 minutes under the broiler should be plenty. Cool for a few minutes, then use foil to remove brownies from the pan and set on a cutting board. Carefully pull the sides of the foil away from the marshmallows and brownies. Cut brownies into 12 squares. Helpful tip: Use a large, WET & SHARP KNIFE to cut the brownies. Slice through the brownie, then clean the knife and slice through again with a clean, wet knife. Keep cleaning off the knife after each cut for the cleanest cuts.